I enjoy the knowledgeable and ever insightful Horace and Anders. The addition of Judd Rubin added some good back and forth and a spit of humor. The discussion of Appleâs new concept of longer lasting offerings was interesting. One wonders if this shift to increased durability also speaks of an inability to bring revolutionary and paradigm shifting new tech on a semi-annual basis as Apple has done in the past. Or at least no faster than their competitors can do so or create their own versions. Mr. Rubin was useful to hear how generally informed but not expert end users may react to these moves. Will keep listening. I listen religiously. Always look forward to new episodes. The other dude besides Horace on the latest episode was not good. Bad jokes and poor commentary and analysis. Horace is a rare individual- a researcher and a toolmaker. Amazingly, every episode is packed with interesting mix of insight and data articulated into stories intuitively. Moises was perhaps the most engaged co-host so be sure to check the earlier episodes as well. This podcast is some of the best time investment youâll find anywhere if youâre interested in change as agency. I have to say, as much as I enjoy the content of this show, Horace's insistence on recording "on the go," or, puzzlingly, on his Apple headphones while at home, lend weight to the expression "phoning it in." Foregrounding the amateurishness of production detracts from and directly contradicts the subject matter. It's a Master Class in business analysis. I'm don't have an MBA, but I find it spell-binding, current, and fun. This podcast is about so much more than Apple. It is about changing the way you see the world... from jobs to be done theroy to disruption to innovation... listent closely and the whole world will look diffent. Horace has a remarkable mind and fascinating approaches to many topics. But his writing is often much better than the podcast, which meanders and repeats itself frequently. A stronger producer, co-host or just additional prep would go a long way toward making it a better listen. The best episode ever. Performing an iPad pro review, ad reads and all, while doing battle with a flying squirrel. This sets a new bar. Clayton Christensenâs books, The Innovatorâs Dilemma, The Innovatorâs Solution, and See Whatâs Next, were required reading in my MBA program, I find this podcast to be really helpful in digesting those theories and thinking critically about applying it. I think Horace Dediu is really insightful and explains himself clearly. This is a good resource if you want to learn more about innovation. You should also check out his website and his twitter feed @asymco. I don't love Horace's delivery style. He's brilliant and insightful and I value his contributions, but I just don't jive with his speaking style. That being said, what he has to say is useful enough that I still listen every week. ...like no other: Horace Dediu (@asymco) is keeping us up-to-date with the basics of disruption theory & job-to-be-done theory. Apple serves as a wonderful backdrop for thr consistent education in how to loook at the (business) world around us and understand the rules od success. Awesome source of inspiration and though food. Horace is one of the greatest thinkers of our time. Horace offers some of the most interesting, thoughtful commentary on the tech industry. Very few people communicate about the business of technology for a broad audience as clearly. Fewer still bother to ground their analysis on actual evidence rather than empty speculation. Horace brings the goods, and is always clear about analysis and interpretation v. conjecture and less supported ideas.Another thing that's great about Horace is his use of cultural studies, history, story telling, and other industries to inform his analysis. This is where MoisÃ©s joins in as the perfect pairing. Fluent in the world of technology, but also in art, film, and anthropology, MoisÃ©s is often able to provide valuable counter examples and help steer the conversation toward an interesting look at contrasts or compliments to a pattern that Horace is working through understanding within tech.Plus, you can tell how much they both enjoy the show and appreciate their audience. Major points.Easily one of my favorite podcasts. Great podcast, topics don't get old! 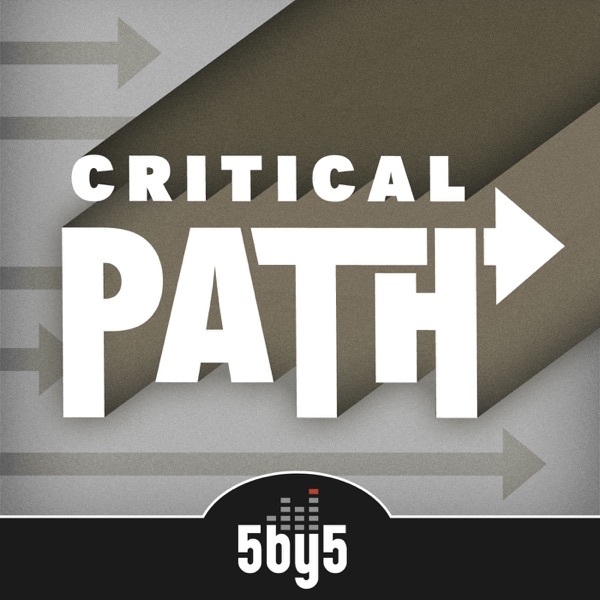 The Critical Path is the main reason why I started listening to 5by5 podcasts. Horace is a genius, he knows what he is talking about. My only complaint lies with Moises. Please Moises, let the man talk and stop the rambling. We understand - you know comics and movies, but please, the only reason why we listen to this podcast is because of Horace. I couldn't take it anymore and had to stop after 35 minutes. Hope the next episode is better. ....it's not illegal yet. Love this stuff. So much to learn. Takes a critical and MBA-like approach to analysis. Recommended! Moises, you need to stop rambling so, so much - it's getting painful. Luckily, the radio in my car lets me fast forward. Sorry to be so blunt. Otherwise, this podcast is topnotch. Feed your business mind the highest quality food. Horace Dediu's analysis of Apple's industry and competitive landscape is worth its weight in gold for business thinkers interested in disruption theory. It is a pleasure to hear the dulcet tones of Dediu's musing on markets, like a soothing melody. I always feel smarter after each hour-long podcast, and can't wait for each episode to learn what Horace thinks about current events and newly released data. The Critical Path is, without a doubt and after two years running, still my favorite listening experience. Horace and Moises, thanks so much making the podcast a weekly treat. I have never missed a minute. I skip THOUGH other podcasts but I skip BACK and listen again to this one.Horace, Moises... Nicely done.Dan... top shelf sir! Horace Dediu continues to bring extremely insightful thinking to the mobile world and other industries. One can't listen to these podcasts without learning something new that has applications well beyond the specifics of the show.Great way to make my commute a productive time! Thoughtful analysis and a real passion for understanding fuel this podcast. Big fan since the beginning and it's still going very strong. And all of that delivered conversationally. This is among a rare breed of podcasts worth repeated listenings and saving for future reference. Horace really has a special mind. He must have been a creative artist in another life before he was an analyst. Some really philosophical stuff lately on the nature of life and death and disruption in business and life. I like to listen to Horace while I drive to work. Or while I enjoy a candy bar. It's good for all times. Horace is a cool name. I like it a lot, but my wife wouldn't let me name our son Horace. Sorry. I tried. Horace is one of a kind. Just an amazing podcast. I've worked in the technology industry for many years and like to think I have a good handle on it. I am often annoyed by journalists and bloggers that think one small change in the supply chain spells doom for a company. I found this podcast by accident and am very impressed with the depth and thoughtfulness of the analysis. The discussions are, in my opinion, riveting. Well done. The hypercritical path. Still Los though. One of the most thoughtful business analysis podcast. So much information and knowledge. He really makes it interesting. Love this one. Horace is one of the best thinkers on the world of mobile computing on the net right now. I look forward to every podcast. I also happen to really enjoy the insights he provides to other industries - he's got a great way of looking at issues. He also happens to be a really humble and lovely guy. Absolutely worth checking out. Horace will make you smarter by exposing you to a variety of novel ideas, all backed with meticulously cultivated data.No matter what you do, I would recommend this podcast as a must listen. Awesome show. I can't wait for each new episode. Horace brings forth insights that really nobody else offers. It is fun to hear a Analyst that predicts Apple's future based on some facts and method. As opposed to so many other Analysts who appear to use Tea leaves, Tarot cards and a weegie board. The interview with Jean-Lois Gassee is very good. Not to be missed if you are interested in the origins of the personal computer. Dan was so completely out of his depth that I somehow found his voice more annoying on this show than any of the others. Glad he was smart enough to know he wasn't needed. A must-listen every week. Without fail. While this show does focus on mobile computing, it's about so much more. The insights, analysis and business strategy that are contained in every show can be applied to just about anything, including personal relationships, careers and growth. Horace continues to knock it out of the park -- I've listened to every episode and as clear, insightful and brilliant as the early shows were, the recent ones continually floor me w ever-improving quality analysis.If you're serious about mobile tech fr a biz analytics, platform-oriented paradigm, this is it. Horace rules. This is the only podcast I am currently subscribed to. Horace has an intuitive grasp of how data can be observed, measured, manipulated to provide meaningful implications, and subsequently put to the test of historical perspective. In many ways he is the quintessential Analyst of Tomorrow.Equally important, Dan is an excellent host who allows Horace to complete his sometimes expansive arks of thought without turning the programs into soliloquies.This podcast is an excellent complement to the Asymco blog, but stands equally well on its own. I recommend it highly.Thank you Dan and Horace! This is by far my favorite podcast. It's changed the way i see the world. As far as business goes it is more inspiring than anything else that I have read or listened to. Start from episode one and move in from there. You will not be disappointed. Mr. Dediu continues to impress me with his genuine curiosity and also his kind spirit: both of these traits radiate from The Critical Path. While constantly looking at pieces of a larger puzzle (or multiple puzzles) and looking for connections and insights to grasp that larger picture and deliver insights and answers, Mr. Dediu does so in a way in which he NEVER comes across as arrogant or a "know it all". In fact, if you can prove him wrong or provide a reason he should question his own data or assumptions, I genuinely believe nothing would make him happier. The Critical Path is truly a pleasure to listen to.